Paco Díaz (Palma de Mallorca, Spain) on 17 February 2011 in Architecture. Superbe cadrage, c'est grand dans tous les sens du terme. grand space and atmosphere like never before. Superb photo, Paco. Tengo ganas de visitarla. Las imágenes que se van viendo son realmente impresionantes. En esta perspectiva se ve la comparación del templo con las personas, inmenso. L'ayant vue en vchantier il y a une vingtaine d'année, je suis émerveillée ce voir la luminosité de l'intérieur . Merci pour cette visite de détails. Astonishing and impressive design. Excellent shot. Me estás dando envidia, tengo muchas ganas de ir a verla, pero me aterra tener que hacer cola y que esté llena de gente. @Marta Mateu: Hola, Marta: yo saqué la entrada por internet y elegí la hora. Luego entré directamente. Así que,... Gracias! Building with great photographical potential. The light has completely changed the character here from your previous . . a masterful work if ever there was one. This is very intense architecture! I have no other words for this image but - OUTSTANDING ! Feels great to view your images again Paco . I missed you too . Superb light in this photo. A great shot, great color, light and subject and well framed! Elle a bien changé en deux ans ! Et j'admire les couleurs de ton cliché ! This will be one of the best series you have ever put on show. La Sagrada Familia will become to Christians what Mecca is to Islam, one of those places that you must visit before you leave this earth. 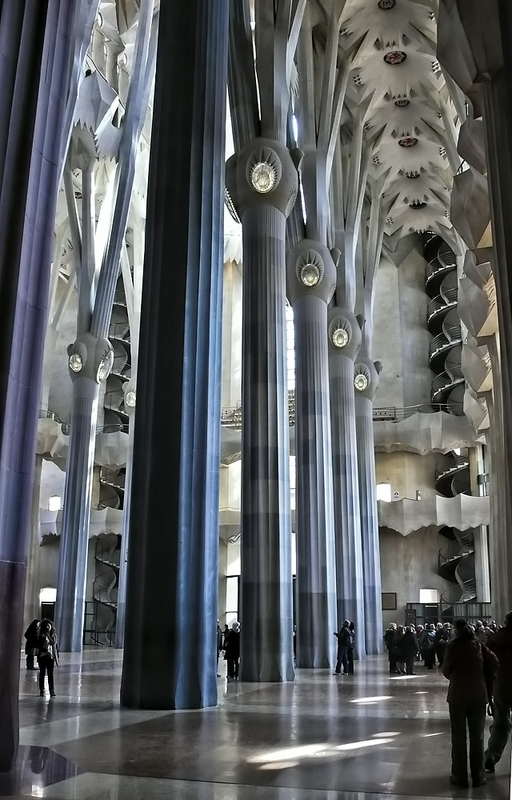 Gaudi's masterpiece is being shown in all of its magnitude by your photographs. Hay qué ver lo que la Sagrada DAmilia nos aporta!!! Tengo ganas de perderme por entre esas solumnas con todos los detalles!!! Igual que la anterior, muy buenas! WOW !! this is such a great image , i love it ~ very NICE !!! 5 stars. It's fantastic ! Grandiose avec un superbe rendu. Preciosa foto. Muy bonitos colores. Magnificent architecture. A sensational photograph. You can be very proud of this one Francisco - it is awesome. This is a beautiful image with the fluted columns and their reflections on the shiny floor. I especially like the details in this fine image. In particular, the spiral staircases at the end of the hall are quite beautiful. Also, the light is gorgeous. Amazing angle and detail. Great shot. This is more earthly....and I like it very much! The columns have superb silhouettes and the people have access to this beauty...a great take here!